Stately and steeped in history, the General Protestant Cemetery is the final resting place to everyone from merchant families to labourers, soldiers, noted photographers, poets, Chinese laundrymen, and the tragic victims of some of Newfoundland’s worst sailing disasters. 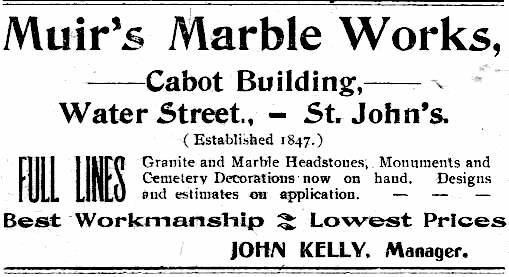 This walking tour will introduce you to some of the cemetery’s most intriguing residents, the significance of gravestone symbols, and the work of local stone carvers, all beneath the shade of some of the last old growth trees in St. John’s. Join folklorist and storyteller Dale Jarvis for a guided walk through this elegant cemetery, which was established in 1842. The tour starts and ends at the historic Leaside Manor, where you will finish your walk with tea and funeral biscuits. Spaces on the tours are limited, and pre-registration is required. Wear comfortable walking shoes, and dress appropriately for the weather. Tour, including tea, lasts approximately 2 hours. Tickets available via Eventbrite here. By day, Dale Jarvis is the provincial folklorist for Newfoundland and Labrador, helping communities safeguard traditional culture. By night, he is the proprietor of the St. John’s Haunted Hike ghost tour. Dale is the author of several books on local folklore, and is a tireless promoter of oral traditions and heritage. Tours of the General Protestant Cemetery are conducted with the kind permission of the General Protestant Cemetery Trustee Board Inc. Maintaining a 176-year-old cemetery is costly work, and a portion of each ticket will be donated back to the cemetery board to assist in the maintenance and upkeep of the cemetery grounds. Thank you for your support in sustaining this historic place! Note: Because of the uneven ground and narrow paths, the historic sections of the cemetery are not wheelchair accessible. The tour is not a ghost tour, but focuses on the history, art, and people of the cemetery. Weather in Newfoundland is unpredictable, and our tours go ahead rain or shine, drizzle or fog, or worse, The Precipitation That Shall Not Be Named. If you book a tour, be prepared to dress accordingly on the day of the tour.